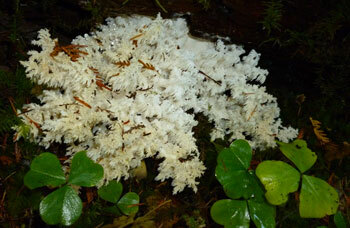 November has been another fungal delight! Yes, it's true. In a month that is filled with family and friends, food and fun, we've managed to spend a fair amount of time in the woods with our favorite fungi, too. It hasn't been our most productive November ever, but it's been very interesting. We've explored some new territory, and we've visited our traditional spots as well. Our favorite Mt. Hood haunts have long ago bedded down with a layer snow while our go-to spots here near Port Orford have sometimes been drowned with inches and inches of rain. Boletes can get "wormy" but this one had no undesirable guests. I have to confess that I absolutely love hazelnuts and cooking with roasted hazelnut oil. So, when I recently found the recipe for "Hazelnut Crusted Pork Chops with Hazelnut Oil" on the web, it wasn't long until I had adapted it to include dehydrated bolete mushrooms that I had previously powdered in a coffee grinder. Truthfully, I like to keep a container of this mushroom powder in my refrigerator at all times - in particular, the powder is a quick flavor enhancer for bland fish and vegetables. 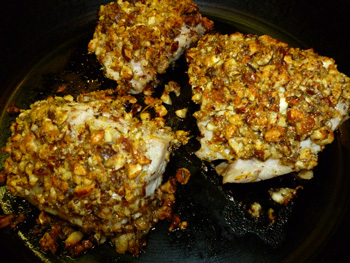 As you might expect, the addition of the mushroom powder created another interesting dimension to this very flavorable dish of hazelnut encrusted chops. Oh, I should also add that I like to brine pork before preparing it in a dish. How do you brine? Combine 1/8 cup salt in 2 cups cold water. Immerse the pork in the solution for 30-60 minutes. Then rinse off the brine solution and dry the pork. True, the brining sometimes seems a little fussy but this extra step pretty much ensures a moister and more flavorful end product. Brining the pork is essential to the success of this preparation. Late October found us back on Mt. Hood, hunting for matsutake (Tricholoma [Armillaria] ponderosum) at 3,000-4,000 feet elevation. On Tuesday, we confidently headed to our most reliable matsutake area, only to be greeted by very cold temperatures and a total absence of the Japanese pine mushroom! Even though we invested an hour or two in this location, we never found a singlematsutake and reluctantly headed back to our vehicle with only a couple of white chanterelles (Cantharellus subalbidus) and one perfect Admirable Boletus (Boletus mirabilis). 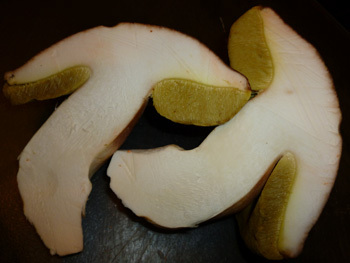 A coral hydnum is already a terrific find!